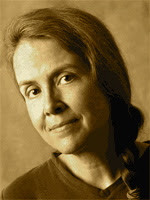 A Year of Being Here: Naomi Shihab Nye: "At the Seven-Mile Ranch, Comstock, Texas"
Naomi Shihab Nye: "At the Seven-Mile Ranch, Comstock, Texas"
I live like I know what I’m doing. the day opens up to let me pass through. how always I’m following each small sign that appears. knows I didn’t see him till he raised his head. Out here it’s impossible to be lonely. and each of you knows how much the other made up. "At the Seven-Mile Ranch, Comstock, Texas" by Naomi Shihab Nye. Text as published in Hugging the Jukebox: Poems (E. P. Dutton, 1982). Art credit: "Giles Ranch Road [in Texas Hill Country] at dawn," photograph by D. K. Langford.